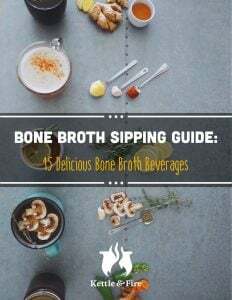 It’s easy to think of bone broth as something you heat up and enjoy during cold weather, but did you know that you can just as easily keep up your healthy bone broth intake during the summer months without getting overheated? Our favorite way is to make bone broth ice cubes. You can throw these chilly cubes into any refreshing drink, but we especially love blending them into smoothies with other healthy ingredients. 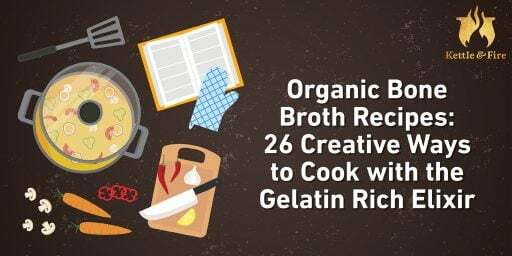 This option is perfect if you’re not too fond of the flavor of bone broth but want its health benefits – you can’t even taste it over the fruity flavor that takes charge in smoothies. 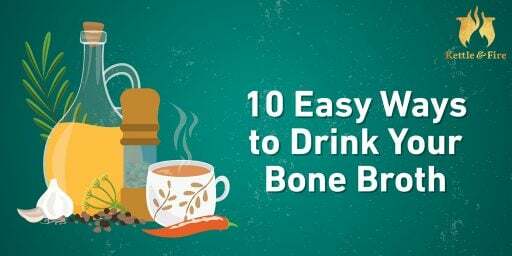 We love making bone broth ice cubes with herbs or spices, which are great in certain beverages or recipes, but you can always keep things simple and stick to the one-ingredient ice cubes – pour the bone broth into an ice tray and freeze just like what we did in our video. We came up with four ways to make our ultimate bone broth smoothies, so you can find your favorite or switch things up. Each one takes less than five minutes. They are perfect for summer breakfast or to just grab and go. This Pineapple Mango Ginger Bone Broth Smoothie gives you an exciting tropical flavor with warm-weather fruits that include mango, banana, and pineapple. We add the bite of fresh ginger and turmeric – and of course our savory bone broth ice cubes – for their kick of flavor and power-packed health value. This smoothie takes on a beautiful orange-yellow hue that brings a tropical sunset to mind. This Pineapple Mango Ginger Bone Broth Smoothie gives you an exciting tropical flavor with warm-weather fruits that include mango, banana, and pineapple. We add the bite of fresh ginger and turmeric – and of course our savory bone broth ice cubes - for their kick of flavor and power-packed health value. Place all ingredients in a food processor. Blend on high-speed for 30-45 seconds until smooth. Pour into a glass and enjoy! 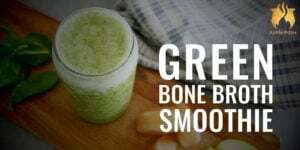 For a super nutrient-packed beverage, try our Green Bone Broth Smoothie. You’ll get a boost of healthy nutrients from the blend of fruits and vegetables, which includes spinach, banana, and apple, that we add to our bone broth ice cubes. The mixture of ingredients creates a delicious flavor that is fruity yet balanced, not to mention that the bright green hue of this beverage adds some excitement to your morning. Hint: Keeping the peel on the apple enhances the color while adding fiber. You’ll get a boost of healthy nutrients from the blend of fruits and vegetables, which includes spinach, banana, and apple, that we add to our bone broth ice cubes. The mixture of ingredients creates a delicious flavor that is fruity yet balanced, not to mention that the bright green hue of this beverage adds some excitement to your morning. A Mixed Berry Bone Broth Smoothie offers the wonderful combination of berries and bananas. This fruit duo gives a strong flavor that will overpower the taste of the included ice cubes. We also add some flax seeds to this recipe to contribute healthy fats and fiber to the nutrients found within the fruit and bone broth. When you’re finished blending, the completed smoothie has an enticing purple-pink hue. This healthy smoothie offers the wonderful combination of berries and bananas. This fruit duo gives a strong flavor that will overpower the taste of the included ice cubes. We also add some flax seeds to this recipe to contribute healthy fats and fiber to the nutrients found within the fruit and bone broth. If you love smoothies that are packed with superfoods and nutrients, our Blueberry Protein Bone Broth Smoothie is for you. This one features health-boosting ingredients that include organic blueberries, bone broth ice cubes, banana and raw honey. Together, this combination of flavors provides a fruity and delicious taste with a vivid blue-purple color. We also add some protein powder and spirulina, which is full of protein and high levels of nutrients to help your body work at its best, making this an ideal daily smoothie. This superfood smoothie features health-boosting ingredients that include organic blueberries, bone broth ice cubes, banana and raw honey. Together, this combination of flavors provides a fruity and delicious taste with a vivid blue-purple color. We also add some protein powder and spirulina, which is full of protein and high levels of nutrients to help your body work at its best, making this an ideal daily smoothie. Now, it’s your turn. Go try our bone broth smoothie four ways and let us know which one you like best in the comments below! Can’t wait to hear from you.